What about allowing more sites in the vicinity of starting towns? There’s should already always be at least one extra expansion site in near the player city. Is there an ETA on the fix for Tigran city quests? It would probably go a long way if the terrain were not so much brown in brown but more colourful and exotic. The shroom stalks in dense vegetation goes the right way (and should be the default terrain created by terraforming). Wetlands could glow with bioluminescence, fertile plains have moss patches, mushrooms and molds in vivid colours, barren are blank rock and boulder fields. At cave entrances, the climate/terrain from above ground could spill over, giving some hints on what to expect and create even more variety in underground features. And bats flyiing over wetland and/or dense foilage instead of butterflies/birds on the ground. there an ETA on the fix for Tigran city quests? Next update! Believe it or not, they were not set up at all, we’ve had to put a ton of things together from scratch which is why it’s taking a little longer. Any new racial skills planned for class units? We have some suggestions here. Maybe, you could consider about some of them at least? Tigran patron Military now gives 7 HP to Tigran Sun Guards and Sabretooth Chariots instead of Fast Healing. I can have a quick look, but I don’t think there’s much I can do much. We’re right at the end of the patching process now, there’s very very little time left. We’re right at the end of the patching process now, there’s very very little time left. Sadly to hear that. Anyway, good luck with your new projects! We have finally moved the Tutorial Campaign to Open Beta! The tutorial focuses on new players, explaining a bunch of stuff from moving your army to how to cast spells or how retaliation works. Note that we do not intent to explain the entire game, just the basic mechanics. We want to give new players the tools to learn the game without overwhelming them with the full complexity of the game. At this moment the Campaign is still in an early stage, but we would like to receive your feedback on it so we can incorporate it before it is all set in stone. STARTING THE TUTORIAL: The Tutorial Campaign is started through the Elven Court Campaign. After the introduction and the first story page of the Elven Court you will get the choice to start the Tutorial. If you chose Yes you will be redirected to Aldor, the legendary isle so pivotal in the history of Elves. We would be grateful if you can test the tutorial and give feedback! What we really want to know is it possible to break anything in the tutorial map? We haven’t done a lot of intensive testing, feel free to break anything! 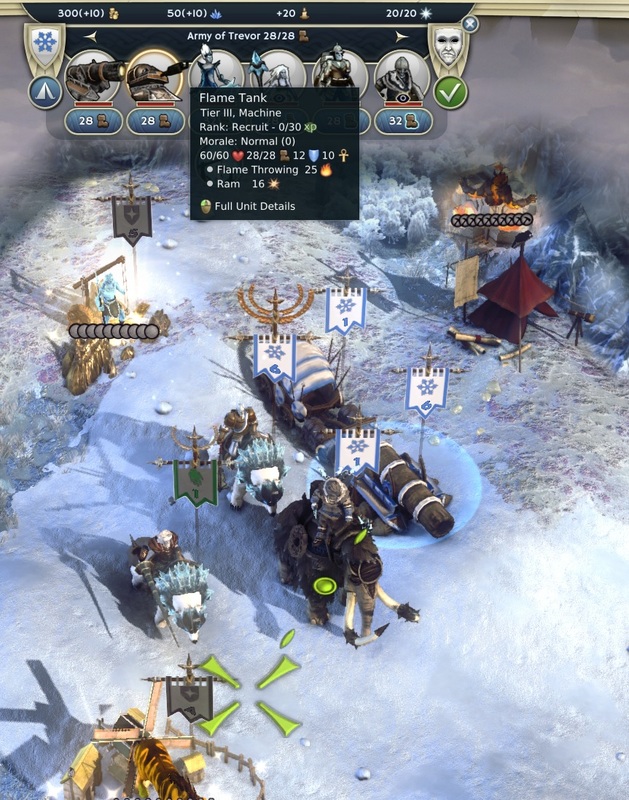 Only minor issue: the bug with the frostlings starting with flame tanks instead of frost tanks is still present. Perhaps it was just missed for this update though. We did fix that AS! I just forgot to put it in the patchnotes… We fixed a similat thing for halflings and party robots. Hmm… it’s still present in my game though. I just started a new settler game with battle settings to test. See screenshot. I can test the party robot thing quickly and check that too. The party robots are still missing too, just for reference. Did you reject planned changes for shrine completely or just have not much time to implement it in this patch? 1) We grant an anti-machine effect to Divine Vengeance, for example a chance to inflict stun for 2 turns on machines only. I honestly don’t know what I can do Zaskow 🙁 No-one in the thread could agree on what should be changed or even if anything should be changed. With the Evangelist/Exalted stuff, there was widespread agreement, with the Shrine there’s no agreement at all. If I change something, and people don’t like it, there’ll be no time to fix it for quite a while. Just wanted to point out not that necessery but still existing misshap. Ancestrial Spirits do not have the Shield trait, while their Sorc. counterparts (the Phantasm Warriors) do have this skill and their models obviously assume they do bear shields indeed. I think it’s just a long forgotten misshap then anything that was put there on purpose. @zaskow, this is the “quit while you are ahead and be thankful” part of the change cycle. Let’s the devs say “oh look, happy customers”, go sleep and or interact with living people (for whatever reason) and makes you seem more reasonable in the next cycle. Anyway, I bet dwarf theocrat is going to be mighty strong now, since their shield and dwarfness make them quite tanky, and they’ll have the extra fire and shock. That also makes the keeper theocrat a bit better, as you could get extra fire from meditate. Anyways, I can’t update, as I keep getting “could not connect to the server” message. Are other people getting this as well? I got it to work just now; so it’s a moot point. Thanks! Overall I like the tutorial, as it’s short, has a steady progression and is very informative. It gives much information on strategic and tactical matters. I like that the messages are popping up once something new things happen; making you aware of mechanics behind tactical battles, like flanking, retaliation, attacks of opportunity etc. The siege on Ekko’s city is somewhat hampered by the lack of a siege unit though. Maybe Werlac could conjure up a Ram or Trebuchet to help you take Ekko down – it helps in the last battle and you could inform new players on how to use this unit-type in sieges like this. Finally, I think the Tutorial should be a standalone campaign or scenario, as that’s easier to navigate to from the main menu. As a new player to a game I find it more convenient to be prompt with a tutorial from the main menu than from the introduction of the starter campaign. Once I gained a level with Sundren, a message popped up with “ERROR! DataObject.Header: ||“. Wow, I really like this patch note! Finally Theocrats get something cool! Thanks @tombles and team. When will this patch be available for GOGers? I can’t give you an exact date, but we want next week to purely look out for crashes and serious bugs to fix before the patch goes live. We don’t want something like AI spell bug getting out again. Once that’s done, the patch should be final and can be released to GoG and made into the default branch on steam. Sorry for the wait, Esvath. I know you and many like you have been waiting patiently for a while, hopefully we can get you something worth the wait! It’s OK, @tombles, take your time. Thanks! This is great! Could we get this for all structure and city site generation options? I’m getting “error saving game” when using the cloud. It says this with manual saves, quick saves and autosaves, but they do save, and they do load and work fine. Sadly this is not possible, since it is now already integrated into the Campaign. We hope that new players first play the tutorial and than continue with the Elven Court, since the Elven Court also teaches the player a lot.